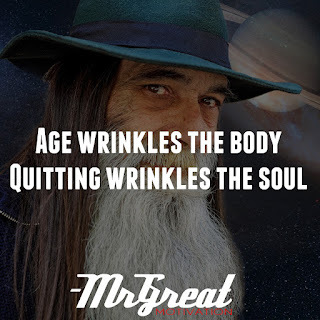 Age will cause ailing in the body, so will continuous quitting cause frailty in the soul. Habitually quitting, making a habit out of giving up, causes damage to you deep inside. Your self-belief is damaged. Your ability to carry out simple tasks begins to falter. You can show yourself that you can stick with it, that you can achieve, even if it’s only an unusual thing. Sometimes an attempt ends in failure, but you can always re-assess the situation, and either try again and determine that the effort required is not worth the result, but don't quit. Start as small as you like, but get busy with something. Take a moment to assess why it was left, figure out what steps it will take to get it back on track and completed, and detail out the first step. Finish the first step. Persevere, and finish it. Then start and finish the next one. The great journey of the rest of your life will start with your next action, so make it a good one. And if it doesn’t turn out as great as you would like, remember the rest of your life starts with the action you take after that. Keep on trying. We need to stay resilient and sharpened if we want to defeat challenges. There may be lots of other worthy or pressing demands which divert attention and it can be hard to say “no” to them. There are choices about smaller things to discard so as not to “quit” on the big one. So who do you know who can help you priorities, stay on target and keep your soul young? Persist. Stay Motivated.